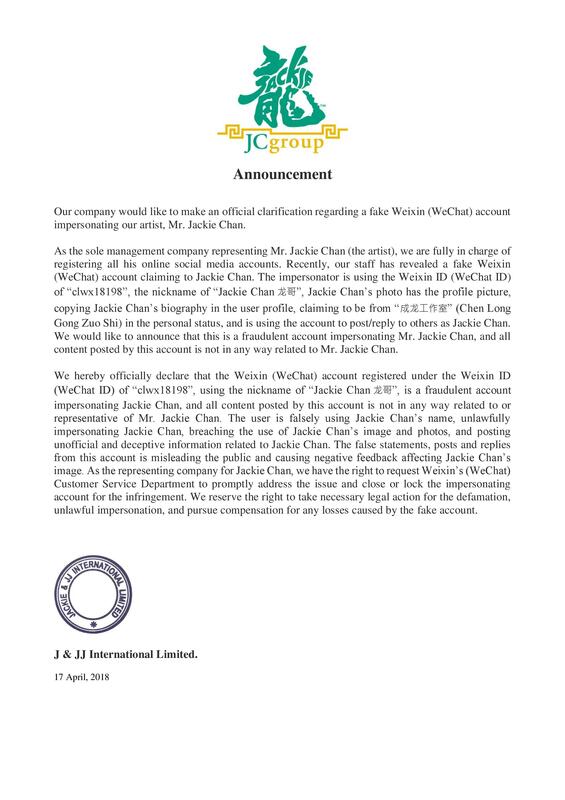 Our company would like to make an official clarification regarding a fake Weixin (WeChat) account impersonating our artist, Mr. Jackie Chan. As the sole management company representing Mr. Jackie Chan (the artist), we are fully in charge of registering all his online social media accounts. Recently, our staff has revealed a fake Weixin (WeChat) account claiming to Jackie Chan. The impersonator is using the Weixin ID (WeChat ID) of “clwx18198”, the nickname of “Jackie Chan龙哥”, Jackie Chan’s photo has the profile picture, copying Jackie Chan’s biography in the user profile, claiming to be from “成龙工作室” (Chen Long Gong Zuo Shi) in the personal status, and is using the account to post/reply to others as Jackie Chan. We would like to announce that this is a fraudulent account impersonating Mr. Jackie Chan, and all content posted by this account is not in any way related to Mr. Jackie Chan. We hereby officially declare that the Weixin (WeChat) account registered under the Weixin ID (WeChat ID) of “clwx18198”, using the nickname of “Jackie Chan龙哥”, is a fraudulent account impersonating Jackie Chan, and all content posted by this account is not in any way related to or representative of Mr. Jackie Chan. The user is falsely using Jackie Chan’s name, unlawfully impersonating Jackie Chan, breaching the use of Jackie Chan’s image and photos, and posting unofficial and deceptive information related to Jackie Chan. The false statements, posts and replies from this account is misleading the public and causing negative feedback affecting Jackie Chan’s image. 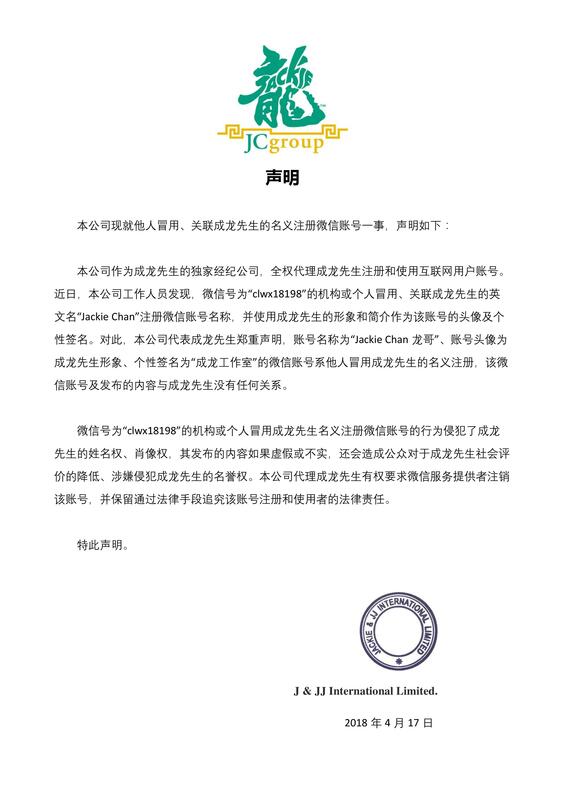 As the representing company for Jackie Chan, we have the right to request Weixin’s (WeChat) Customer Service Department to promptly address the issue and close or lock the impersonating account for the infringement. We reserve the right to take necessary legal action for the defamation, unlawful impersonation, and pursue compensation for any losses caused by the fake account. Listen to Jackie’s new song: 物是人非 – Wu Shi Ren Fei, released today for everyone to enjoy! This song is dedicated to Jackie’s friends, family, and brothers who have passed away. The full album will be released in August, 2018.